We used a piece of leftover aluminum flashing to make a fairing for the front of the roof rack. The van is now much quieter and may be more fuel efficient. You can buy fairings by companies like Inno and Thule that are designed to clamp to roof rack rails. Some are *almost* wide enough for a Sprinter roof. We were about to buy one when we decided to try a DIY alternative instead. We’ve already mentioned using leftover aluminum siding trim to make brackets for our ceiling coving. We used another piece to make a fairing. It’s stood up really well to over 2000 miles of driving, sometimes at 80MPH with gusty winds. It was really simple to make. We have Vantech roof rack rails which are set up to support our solar panels. They have a t-slot in their underside. 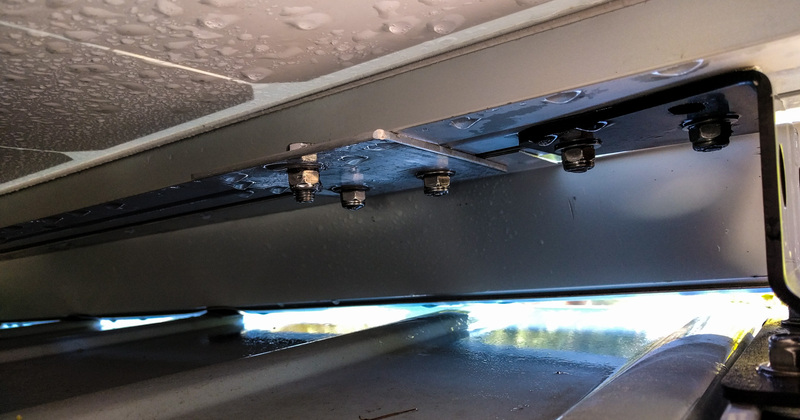 The solar panels are held in place by aluminum plates that bolt in to these t-slots with threaded studs. We just slipped the aluminum siding between the support plate and the roof rail. We also moulded the bottom of the fairing to the ridges in the van roof. A couple of whacks with a hammer over a wooden form created the correct shape. We protected the van roof using some leading edge/propeller tape. 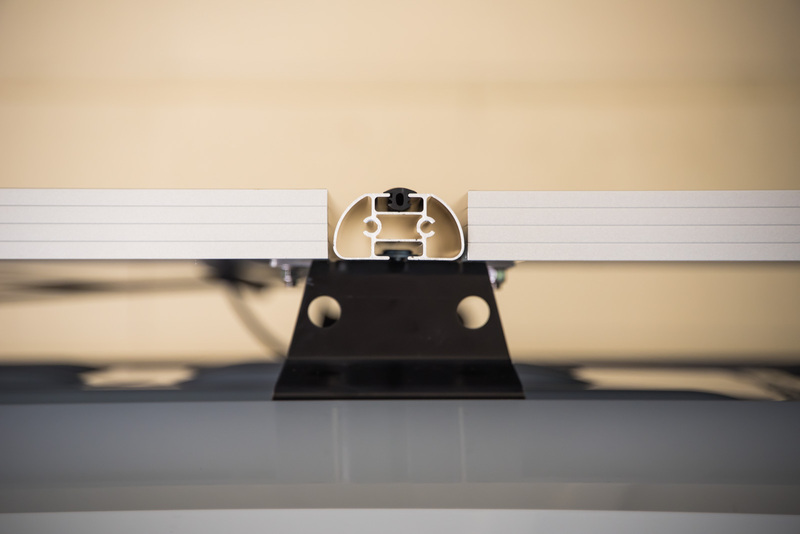 It’s a strong, see-through adhesive polyurethane tape designed to prevent wear. Then, some small pieces of VHB tape between the fairing and the roof stick it in place and prevent rattles. The color doesn’t quite match the van, but who cares? The ride is much quieter now. 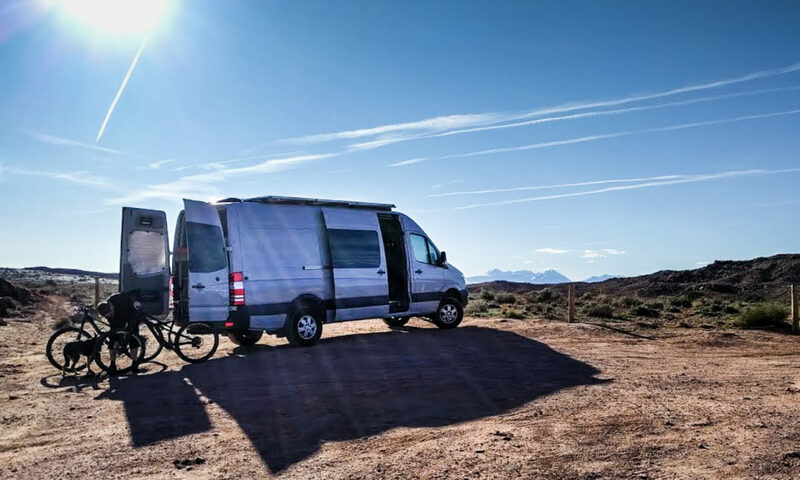 It’s hard to know whether we’re also saving fuel because we drove the van pretty hard on our last road trip. However, the reduction in noise alone would suggest we’re being more efficient overall. I love this solution and would love to copy it. Is that flashing a gable cap? TamagoVan – the flashing we used was a piece of aluminum that was in our barn when we bought the property. It’s most likely from a commercial building. Unfortunately I can’t tell you the specifics. However, it does looks very much like gable cap – perhaps slightly “relieved” to open up the 90 degree angle to more like 100 or 110 degrees. Nice! You’ve got a good eye for repurposing found objects! Thanks for the reply.